Destiny is an open-world massive multiplayer first-person shooter video game developed by Bungie, released on September 9, 2014 for the Xbox One, Xbox 360, PlayStation 4 and PlayStation 3. . The game's sequel, Destiny 2 was released on September 6, 2017. 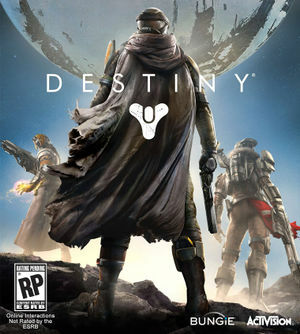 Unlike typical FPS games, Destiny features role-playing elements and as such has been likened to "World of Warcraft in space," while Bungie refers to it as a "shared world shooter." Destiny is set in the 28th century in a post-apocalyptic setting. Humans had spread and colonized the Solar System with the help of a spherical entity known simply as "the Traveler" who reshaped planets and moons, and taught humanity new technologies and mystical powers that led to a time later called the Golden Age. An event known as "The Collapse", an attack from the Darkness, an unknown faction or entity, saw the dissolution of these colonies and left mankind on the brink of extinction. The only known survivors of the Collapse are those living on Earth, who were saved by the Traveler. The Traveler hovers above the last remaining human city as a large spherical body, and its presence gives the Guardians of the City—the last defenders of the human race—the ability to wield an unknown power. Upon mankind's first attempt to repopulate and reconstruct after the Collapse, it was discovered that hostile alien races have occupied mankind's former colonies and civilizations. The player takes on the role of a Guardian of the City, and is tasked with investigating and destroying these threats before the remnants of humanity are completely wiped out. Centuries after the collapse, a stray Ghost wanders through the ruins outside the Cosmodrome, searching for a new Guardian. It finds the player character among the ancient remains, and revives them. Ghost leads the player out of the Cosmodrome and back to The Last City after finding a ship, and introduces the player to the people of the Tower. The Guardian returns to the Cosmodrome to explore; after slaying an Archon of the House of Devils, the player gains an audience with the Speaker, who confides in them that the Darkness is returning, and that the player must help protect the City any way they can. The player makes two important discoveries while in the Cosmodrome; the first is that the Hive, who had slain countless Guardians after they were beaten back to the Moon, have returned to Earth to prepare for an invasion. The second is that Rasputin, one of the legendary warminds, has survived the collapse, and has restored contact with the rest of the solar system. The player travels to the Moon to investigate the Hive threat; they receive an urgent message that the Hive are attempting to drain the Traveler of its light, and that they must be stopped at all costs. However, they also run into a mysterious stranger, who tells them to meet her on Venus to stop another rising threat. After stopping the Hive ritual, the player travels to Venus and discovers the Vex, a machine race bent on dominating reality itself. The Stranger tells the player that the only way to stop the Vex and save the Traveler is to enter the Black Garden and destroy its heart. The player seeks counsel with the Awoken of the Reef; Queen Mara Sov tells them that the only way into the Garden is to retrieve the eye of a Vex Gate Lord. They assume it to be a suicide mission, but the player returns with the eye. The Queen tells the player that they now owe her a favor in return for her information. The entrance to the Black Garden, located on Mars, lies behind thick Cabal defenses. After successfully restoring the Gate Lord's eye using dormant Vex technology, the player enters the Black Garden, a strange Vex realm outside of normal spacetime. At its center is the Black Heart, an abomination whom the Vex worship and seek to use to bend reality to their will. The Guardian kills its protectors, the Sol Progeny, destroying the Heart and freeing the Black Garden from Vex control. Light begins returning to the Traveler. But to finish off the Vex threat, the player must enter the Vault of Glass, the source of the Vex's reality-altering powers, and kill its leader, Atheon. Eris Morn, the last survivor of a fireteam to stop the Hive god Crota, is looking for Guardians to help her. The Hive's return to Earth is but a prelude to the return of Crota, whom his followers are attempting to awaken. Eris sends the player into the Cosmodrome to stop the invaders, especially after they attempt to kill Rasputin. She then sends the player to stop the Hive's awakening ritual on the Moon. After eliminating Crota's generals, the player finishes off Crota himself in his netherworld, the Oversoul Throne, deep within the Hellmouth. The Reef is embroiled in civil war as the House of Wolves, a Fallen house whom Queen Mara Sov had conquered, are now in open rebellion. Their leader, Skolas, has declared himself the Kell of Kells and wishes to unite the Fallen under his banner. The Queen has summoned the Guardians to aid her in ending the rebellion, in return for the Reef's treasures. The player is aided by Petra Venj and Variks, The Loyal, with whom they search for Skolas and put a stop to his plans. After failing to seize control of the House of Devils and House of Kings, Skolas instead attempts to seize control of the Vault of Glass and the Vex technology within. The player finally captures him atop the Citadel, stopping him from summoning his entire House through the Vex's time portals. Skolas is sent back to the Prison of Elders, where he's finished off once and for all. Oryx, the father of Crota, has sent his Hive fleet to avenge his fallen son. Using his terrible power, Oryx creates a new army called the Taken, and lays siege to the entire solar system. The Awoken fleet attempt to stop him before he can enter the Inner System, but they are utterly destroyed. He then starts Taking the Cabal stationed on Phobos, which catches the Vanguard's attention. Responding to a distress signal, the player is sent to investigate. Upon seeing the devastation, the player is confronted by a vision of Oryx, who tells the player that he is there to pay back humanity for his son's death. Realizing the threat that laid before them, Cayde-6 crafts a plan with the player to sneak aboard Oryx's Dreadnaught. Though they are successful, they cannot enter Oryx's inner sanctum until the player becomes Ascendant; Eris helps the player recover the last fragments of Crota's Soul, allowing entry into Oryx's chambers, where they duel. Though Oryx's physical form was defeated, he retreated even further into the ship, recovering his strength. Meanwhile, the Guardians work towards pushing the Taken out of the system. Once Oryx's lieutenants, the Court of Oryx, have been defeated the Guardians push deeper into the Dreadnaught to seek out Oryx within his Ascendant realm. There, he confronted the Guardians with his full might, even pulling them into a Darkness dimension. But in the end, using Light stolen from his pawns, Oryx was slain permanently. The Fallen House of Devils, while looting ancient tombs from the Golden Age, accidentally unearth a self replicating nano-technology plague known as SIVA within the depths of the Old Cosmodrome. This plague mutates the Devils into powerful machine gods which collapsed The Wall in Old Russia, prompting Lord Saladin, the last of the Iron Lords, to personally lead the Guardians in a final stand against the plague, raising a new generation of Iron Lords to guard the Last City once more. Social: Non-combat locations where players can store or acquire new gear, pick up quests and bounties, or meet other Guardians. Story Mission: 1-3 player activities, tie in with the main arc of the campaign. Quest: 1-3 player side missions that sometimes tie in with the main storyline. Strike: 3 player activities based on fighting through an enemy encampment to reach a boss at the end. Nightfall Strike: An endgame, high-difficulty version of strikes that offer high rewards. Patrol: General team-based exploration based on gathering of resources and tracking down bounties. Raid: Endgame 6 player missions of high challenge, featuring multiple boss fights, deadly enemies, and puzzles. Arena: Endgame 3 player challenges with rotating missions and modifiers. Crucible: Player vs. player gameplay. Multiple playlists ranging between score and objective-based gametypes are available. Iron Banner: A special event in the Crucible available every other month for special rewards to those who compete. Trials of Osiris - Endgame 3 player Crucible event available every weekend that offers high-level exclusive rewards to those who win consistently. Public Event: Optional cooperative multiplayer events that are dynamically generated in the game world. Can be found in public spaces in the game world. Sparrow Racing League: 6 player, 3 lap race to the finish using the player's Sparrow that only occurs during live events such as the Dawning. The event is a joint project hosted by both Amanda Holliday, the Tower shipwright and Lord Shaxx, the Crucible Handler. Characters are the same across all game modes; players can bring items that they earn in PVE content into the Crucible and vice versa, but there are weapons and armor specifically designed to be more useful in that type of gameplay. Players can save up to 3 characters and can only share weapons, artifacts and consumables across all three of them. Characters are created by the player and can be one of three different classes: Hunter, Titan, or Warlock. Each class has its own unique abilities, ranging from melee attacks to grenades to their iconic Super ability. Players can also choose race for aesthetic purposes, ranging from Humans, Awoken, and Exo. Combat focuses mainly on typical FPS mechanics, with players able to carry one Primary Weapon, one Special Weapon, and one Heavy Weapon, with the option to carry up to nine other pieces of gear for that same slot at a time, periodically exchanging things through the Vault, a command center that can be accessed by any one of a player's characters. In addition to class-specific armor, each class also has access to class-specific abilities within each subclass unique to the character you play as, which can dramatically change the tide of a fight if timed correctly, such as different types of grenades, perks for a super attack, and build slots for maximizing different aspects of your character. Leveling up a subclass unlocks new abilities and perks; gear can also provide unique perks, so acquiring loot to create the best combination of perks and abilities is often desirable. Players explore the different planets of the Solar System. Available locations are Earth (which features three destinations, the Cosmodrome, The Plaguelands and The City), the Moon, Venus, Mars (including Phobos), the Reef, the rings of Saturn via the Dreadnaught, and Mercury (under specific conditions). Each planet comes with its own set of Story Missions, Strikes, Crucible maps, Patrols, and sometimes Raids or other activities. The Destiny Ghost Edition is the second-tier physical limited edition of Destiny; includes a Ghost replica, Golden Age relics, a letter, Steelbook, folio of story-based material and the Destiny Expansion Pass - as well as extra digital content. 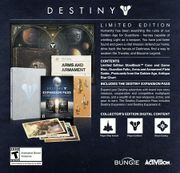 The Destiny Limited Edition is the first-tier physical limited edition of Destiny; includes a Steelbook, folio of story-based material and the Destiny Expansion Pass - as well as extra digital content. The Destiny Digital Guardian Edition is a digital only bundle; it includes a digital copy of Destiny, early access to Vanguard armory, the Destiny Expansion Pass and aforementioned digital content. Players can access a number of free support apps, either on their smartphone or in a web browser. These support apps provide access to in-game content, as well as information regarding the game. The Destiny Companion App offers a condensed newsfeed from Bungie.net and access to the site forums, as well as the ability to access one's character and inventory and receive updates on special events. The Destiny Planet View allows players to explore areas in a Google Earth style browser app. All three limited edition bundles were announced to ship with the Destiny Expansion Pass. The Dark Below was released on December 9, 2014, and included in the Expansion Pass. The House of Wolves was released on May 19, 2015, and included in the Expansion Pass. The Taken King, the first Comet, was released on September 15, 2015. It is not included in the Expansion Pass and must be purchased separately, although buying The Taken King without having purchased the previous two expansions granted access to all three expansions for the price of one. The Rise of Iron expansion was released on September 20, 2016. Owners of the PlayStation versions of Destiny receive timed exclusive content. Year One content has been made available to Xbox players, but Year Two and Year Three content will remain exclusive to PlayStation until September 2017. Year Two content exclusivity was originally set to expire in September 2016, but Sony and Bungie extended the term for an additional year. Several pre-order bonuses were available at certain retailers. The Vanguard Armory was a downloadable content pack that added several low-level Uncommon weapons and a class-specific helmet to Roni 55-30's inventory. The weapons scaled depending on the player's level; level 5 versions would be available for purchase until the player reached level 10, at which point level 10 versions would be available. In addition, the player gained the Vanguard Honor Emblem. The Sparrow S-10V was an Uncommon Sparrow included with Destiny pre-orders at Gamestop. The S-10V was exclusive until January 1, 2015, when it became available to all players. The Blacksmith Shader was a pre-order bonus for Destiny players who also pre-ordered Call of Duty: Advanced Warfare. Bungie also occasionally distributes codes for the Blacksmith Shader during special events and giveaways. The Destiny Alpha, a closed Destiny alpha test accessed by signing up after E3 2014, was live between June 12 and June 15, 2014 for PlayStation 4 and PlayStation 3 platforms only. The Destiny Beta was a public Destiny beta test, accessed by pre-ordering the game from selected retailers. The beta was released on July 17, 2014 for PlayStation 4 and PlayStation 3 platforms, while Xbox One and Xbox 360 access began on July 23, 2014. The Beta became open to anyone, regardless if they pre-ordered, on July 25, 2014. The beta ended for all platforms on July 27, 2014. Alpha Lupi is the alternate reality game (ARG) that began on February 11, 2013, to herald the announcement and reveal of Destiny. Over the course of seven days, a forum account run by Bungie released cryptic images and messages to be solved by the community prior to the Febraury 17th public release of Destiny information. Final results of the ARG, once solved included an mp3 track by Marty O'Donnell as the background music and a completed image of the entire solved puzzle. The Pathways Out of Darkness ViDoc was released February 17, 2013. It is named in reference to Bungie's earliest first-person shooter, and first commercial success, Pathways Into Darkness. PlayStation 4 Official Announcement was released February 21, 2013, detailing its release on PlayStation 4 and featuring more in-game material. Character Development was released March 28, 2013. It was shown in Bungie's GDC 2013 presentation. This video provides a glimpse into the character art, development, and design of Destiny -- from early sketches and concept art, to animation and in-engine 3D character models. The Law Of The Jungle was released May 23, 2013. The trailer shows a Guardian recalling the moment when he was first taught the most important lesson of all – The Law of the Jungle. Out Here in the Wild was the second Destiny ViDoc and was released on August 22, 2013. It is named in reference to the Crow's dialogue in the trailer. This gameplay trailer was released on April 28, 2014. Bungie had began work on Destiny by 2010. During development, Destiny was given the codename "Tiger." When designing the game, Bungie wanted to push themselves away from their Halo series. While Halo gravitated towards the "hard" side of the sci-fi spectrum, Destiny was designed to be "mythic science fiction"—a world rooted in science, but with fantastical elements. Originally it was more akin to pure fantasy, with designs for knights, swords and sorcery in a white city on a hill. However, the designers thought they were denying themselves as per their preference for science fiction, so they decided to incorporate the elements together. The series was first alluded to by a poster in Bungie's previous game Halo 3: ODST. The poster showed an image of the Earth and Moon (or possibly the Traveler), with the caption "Destiny Awaits". The story of the game was worked on by Joseph Staten and his team. During development, they put together a "supercut"—a two-hour video comprising the game’s cinematics and major story elements. The supercut involved a story where players hunted for the warmind Rasputin, after the Hive brought him to the Dreadnaught. The game's third act would have taken place on the ship as players rescued the warmind. Osiris would act as a mentor to the player, and also had a robotic assistant. Uldren Sov was originally known as "the Crow," and would help players find Osiris. Charlemagne also made an appearance. Story missions would begin and end with cutscenes. In July of 2013, this was showed to Bungie's leadership, to negative reaction. They decided it was too campy and linear, and quickly decided to scrap Staten’s version of the story and start from scratch. An issue was that the setting's worlds were all visited within the first few missions of the game, and this, in the view of Bungie's senior leadership, disrupted the game's rhythm. Furthermore, Jason Jones wanted a less linear story. In the coming weeks, the development team would devise a new plot, overhauling Destiny and stitching together the version. Plot threads were abandoned, characters were overhauled, and most of the dialogue was rewritten, despite Staten's objections. In this time period, the developers created the Director, allowing players non-linear access to worlds. Jones also organized a series of "Iron Bar" meetings, where he and other top creators at Bungie like art director Chris Barrett and design lead Luke Smith would figure out how to cobble together a new, less linear plot for the game. This small group of developers spent the next two weeks sketching out a new plot and figuring out how to fit in the story missions they’d created over the past few years. In this period, the Dreadnaught was cut from the game, and the order of planet progression was changed. Lore that Staten had developed for the game ended up in the Grimoire. The game was originally projected for release in September, 2013, but these story revisions occurred post-August 2013, pushing the game's projected release date to March, 2014. As the story was revised, further improvements were made to the gameplay. The game finally saw release in September, 2014. A contract signed with Activision stated that Bungie was to release disc-based sequels to the game every second year up until 2019. The "largest downloadable product" would then be released in 2020. This was based on the projected 2013 release date however. The game sold $500 million worth of units within 24 hours of launch. One in five copies of the game have been sold digitally. Heavy criticism was leveled against the game's story and its style of delivery. As of November 2015, the game has over 25 million registered users. Concept art of Rasputin destroying the Citadel. The Vex on what seems to be a lake.